As an aesthetician, I can tell you that one of the most tempting things to use on your face, if you have acne, is anything that you may feel will make it look better faster. Does using Neosporin help to heal your face? Or will it cause more damage? The answer is that it is almost certainly not a good idea to use Neosporin if you have acne, but let's talk about the reasons why. In this post, we will also discuss other options available to you to help soothe your skin and treat your acne. Does Neosporin for Acne Work? Why is it so tempting to use Neosporin for acne? Well, with the promise that Neosporin can heal cuts quicker than your body, it's tempting to think it may work on your acne as well. But, it's just not the case. To understand why that is we need to talk a little bit about acne. The best advice you can get when it comes to acne is to simply leave your skin alone! If you pick at your face around a blackhead or a whitehead, you run the risk of damaging the skin and causing local inflammation. This inflammation is referred to as cellulitis when it is located on the skin. When you mess around with your face you cause irritation, inflammation, and it actually makes your pimple look even worse. Not only that, but you also run the risk of pushing the substance inside of the pimple even farther into your skin which takes it even longer to come to a head. And that's when Neosporin looks enticing. Why not use a triple antibiotic ointment to try and help your skin heal even faster? It does until you realize that acne isn't an infection! And that antibiotics can actually cause a worse reaction on your face and skin. And that's exactly why I don't recommend it. Antibiotics are designed to treat infections in the skin, not inflammation. When you have acne, the redness that you see is the result of local inflammation (often made worse by picking at your face). So, using an antibiotic will have no positive benefit in these situations. What's even worse is that antibiotics are not necessarily harmless substances either. Especially not when placed on the sensitive skin of your face including the nose, eyes, and neck. In fact, it is estimated that up to 20% of people react to the polymyxin found inside of Neosporin and other triple antibiotic ointments. People who react negatively to Neosporin often react with a rash, swelling, or worsening redness! Does that sound like something that you want to have happened if your primary goal is to heal your face even faster? The answer is obviously no and this is probably the number 1 reason I don't recommend the use of Neosporin for acne. But what else is in Neosporin? Neosporin and other triple antibiotic ointments contain a combination of 3 antibiotic ingredients. Usually, they contain the following: Polymyxin B, Neomycin, and bacitracin. These antibiotics may be great if you suspect that you have a superficial (small) infection after a cut or bruise, but they should not be used on your face if you do not have an infection. We know that the indiscriminate use of antibiotics (oral or topical) can lead to changes in the bacterial concentration in your gut and on your skin. What you may not realize is that bacteria live on your skin and this bacteria contribute to the glow, look, and feel of your skin. Killing off this bacteria (and allowing bad bacteria to grow in) will only cause more harm down the road and may increase your risk of developing acne. My recommendation is to take a more holistic and safe approach to treat acne and putting ointments on your skin. In many cases, you may want to simply avoid using anything other than a cleanser or an astringent on your skin (this helps keep bacterial levels healthy and prevent excess oil production). But what if you want to use some spot treatment? Spot treatment is the use of targeted ointments and creams directly on your pimple (or pimples) without affecting the surrounding tissues. Certain ingredients can actually accelerate the development of your pimple and help it come to a head even faster. These therapies can help treat isolated pimples but should not necessarily be used on your entire face. It's also important to realize that some oral supplements (such as Zinc, Vitamin C, and probiotics) may help treat your acne. But those recommendations only target the pimples that you are already suffering from. What are you supposed to do about preventing future pimples from occurring? In order to do this, you may need to change the way that you evaluate acne. I tend to get the best results with clients by taking an approach which takes into account both the inside of the body and the outside. In this approach, acne is the cause of something wrong with the inside of your body and the pimples are a manifestation of that problem. The good news is that you can treat this issue, but it does take a unique approach and one that includes both topical ointments and serums but also a look at what you put into your body. The food that you put in your mouth - Eating unhealthy, sugary based products will not help your acne! Your hormones - Your hormones including thyroid hormone and testosterone play an important role in regulating your skin. Hypothyroidism and high testosterone are common causes of acne and these conditions can be treated by changing your diet and taking certain supplements. What you put on your skin - Lastly, and this is the part that most people focus on, is what you put directly on your skin. Using low-quality lotions, creams, and serums can exacerbate inflammation and lead to acne. You can prevent this by only using high-quality products which contain the right type of ingredients! Instead of using Neosporin as a 'quick fix' for your pimples, make sure you treat the root cause and prevent future breakouts from occurring! But, beyond just what you put on your skin, or inside of your body, there are also other therapies which can definitely help prevent breakouts but also help to heal your skin even faster and even out your skin tone and texture. I'm a huge fan of these therapies, partly because I do them on a daily basis, but also because I think they are amazing and work great! Microneedling - Microneedling is a powerful anti-aging tool which also helps reduce acne and can even treat acne scars. This procedure is fast, effective, and relatively cheap (compared to laser therapy). Chemical peels - Chemical peels are done by applying concentrated acid to the skin and leaving it on for a selected period of time. The peels then cause exfoliation, help remove blackheads and whiteheads, and help the skin come back tighter than before. Prescription retinol - Prescription retinol is vitamin A but in a higher dose than what is available over the counter. This prescription is highly effective at treating both acne and in making your skin look younger. If you struggle with acne, and if you want your skin to look good for years, then it may be a viable option for you. The only downside is that it will require a prescription from a doctor. You'll want to avoid the use of Neosporin if you have acne and instead focus on other therapies designed to treat the underlying cause of your acne or pimple. Avoiding Neosporin is important because it can worsen inflammation, increase irritation, increase redness, and delay the healing time of your pimple. Better options include using targeted gels and serums directly on your pimple and to stick to using cleansers and astringents on your face in the morning and night. 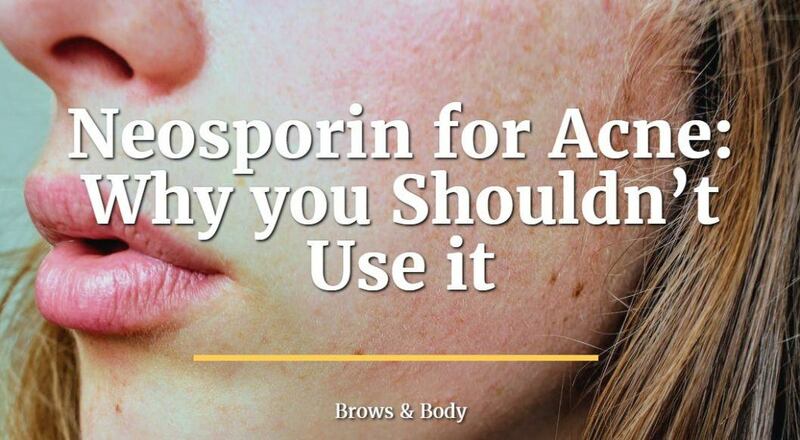 Have you used Neosporin for acne in the past? What other treatments have helped reduce or cut back your acne?